A pretty busy Friday night for the New York Ranger and New York Islander prospects as their teams jockey for positions in the standings before the holiday break. As many as 4 of the prospects in action on Friday could see themselves heading to Europe to play in the World Under-20 championships. Anthony Duclair (NYR 2013 3rd) once again finds himself earning a star for his efforts. Seriously it is hard to find new ways to praise Anthony (The Duke) Duclair as he has been the only Ranger prospect to show any serious offensive game this season. Duclair has been playing as if he wants to prove that last season was a fluke and he should be seen as a serious NHL prospect. 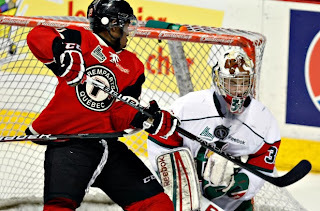 Duclair earned the game's 2nd star with a 1-1-2 effort as his Quebec Remparts defeated the Halifax Mooseheads via the shootout 4-3. Duclair had an almost perfect night as besides the points, Duclair was a +3 on 4 shots with going 0-4 on his faceoffs and missing on his shootout attempt as the only blemishes to his game. Duclair had the only assist on Fabrice Herzog's shorthanded goal at 14:13 of the first period which gave the Remparts a 2-1 lead that they took into the 1st intermission. In the 2nd period after Halifax had scored twice to take a 3-2 lead until Duclair scored his 24th goal of the season at 14:14 to tie the game. The win moved the Remparts into 7th place overall in the QMJHL while Duclair's 1-1-2 improved him to 24-16-40 which is 10th in the QMJHL. And while all of us (myself included) have been raving about Duclair's offense, it would be unfair not to mention the improvements in other areas of his game. After starting the season with 26 PIMS in his first 12 games, Duclair has just 8 PIMs in his last 12 games. Duclair has earned time on the penalty kill as his defensive game has shown solid improvement since the beginning of the season. The Duke is doing very well for himself. Taylor Cammarata (NYI 2013 3rd) had a goal, Jake Bischoff (NYI 2012 6th) an assist and Brady Skeji (NYR 2013 1st) also had an assist as their top ranked Minnesota Golden Gophers played to a 2-2 overtime tie against Michigan State (who earned the shootout point). Cammarata returned to the Minnesota lineup after missing last weekends games with an injury got Minnesota going with his 4th goal of the season which the primary assist went to Bischoff (his 2nd). Skeji earned his 3rd assist and 5th point (2-3-5)of the season with the primary assist on Minnesota's 2nd goal. Cammarata is 4-8-12 and Bischoff 3-2-5 as the two teams will face each other on Saturday. In a rematch of last year's WHL finals, Griffin Reinhart (NYI 2012 1st) and his Edmonton Oil Kings hosted the Portland Winterhawks on Teddy Bear Toss night in Edmonton. Reinhart earned a secondary assist on Edmonton's 3rd goal but this game went to the shootout before Edmonton came away with a 5-4 win. A shame that because of travel distance that these 2 teams only face each other once a season unless they meet in the playoffs. It was an entertaining game as Edmonton built up a 3-1 lead in the 3rd period only to see Portland come back with a goal with just 56 seconds left in regulation to force overtime. Portland dominated the first period with Edmonton dominating the second. The 3rd was a wild crazy shootout with both teams putting up 17 shots each. Reinhart's assist gives him a 2-9-11 mark on the season. Robbie Russo (NYI 2011 4th) had a primary assist on 11th ranked Notre Dame's 3rd goal as they defeated Umass-Amherst 5-3 in Hockey East action. For Russo it was his 8th assist and 11th point of the season as Notre Dame improves to 3-3-1 in Hockey East action. Teammate Steven Fogarty (NYR 2011 3rd) remains out with a lower body injury with no timetable for his return. Jesse Graham (NYI 2012 6th) had a primary and a secondary assist but his Saginaw Spirit fell behind 3-0 in the 2nd period and eventually would lose 5-3 to the Kitchener Rangers. The Spirit are winless in their last 4 games (0-3-1-0) as Graham is now 0-4-4 with the Spirit and 6-14-20 overall this season. Adam Pelech (NYI 2012 3rd) was scoreless as was his teammate Troy Donnay (NYR 2013 UFA) as their Erie Otters won their 6th straight game 2-0 over the Ottawa 67's. The Otters defense got the job done helping goalie Oscar Dansk earn his 4th shutout in 18 games played this season. The Otters are a CHL best 25-4-1-0 and have gone 9-1 in their last 10 games. Victor Crus-Rydberg (NYI 2013 5th) was scoreless as his Plymouth Whalers lost to the Sault Ste. Marie Greyhounds 4-3. The Whalers dug themselves a 0-3 hole and could not recover. Adam Tambellini (NYR 2013 3rd) was scoreless on 1 shot as North Dakota defeated Western Michigan 3-2. Tambellini was the 4th line center and for the most part was not in the flow of the game through no fault of his own. It seemed like every time Tambellini's line would hit the ice there would be a stoppage of play or TV timeout which led to his line being replaced. In the 3rd, I got to see Tambellini used on the North Dakota power play being used as the body in the crease trying to screen Western Michigan's goalie. Tambellini did a good job staying as a shadow setting screens but his teammates could not get the puck on net. They list Tambellini at 6'3 but he looks bigger than that height-wise but seriously needs to hit the weight room. This could be a diamond in the rough as he skates quite well for a big man. Ryan Pulock (NYI 2013 1st) had one of those nights where little went right as his Brandon Wheat Kings lost to the Swift Current Broncos 4-3. Pulock was scoreless but a -3 on the night. Goalies Mackenzie Skapski (NYR 2013 6th) and Stephon Williams (NYI 2013 4th) were both "DNP" for their respective teams. Kyle Burroughs (NYI 2013 7th) was not in the Regina Pat's lineup as he has to go through the WHL's concussion protocols. Burroughs was injured Wednesday night after taking a nasty hit from Brandon Wheat King Jayce Hawryluk. Hawryluk received a 2 game suspension for the hit and I wish the major juniors and the NCAA would adopt a rule where if a player is injured as the result of a dirty hit then the offending player is suspended for as long as the injured player is unable to play plus his suspension. To me it is wrong that a player can be punished for a dirty play but could wind up playing while the player he injured remains out of action. Make the punishment fit the crime.